Happy New Year! Where does the time go? I already was trying to get used to the new year of 2017 and now January is already almost over! I hope everyone had a nice holiday and is ready to have a great year! The National Adorable Contest has started again, so make sure to bring your little ones (up to age 12) to enter them in this contest. I had 3 winners last year that each won money and a wall portrait! Here is the link to see all the winners: https://acilab.com/adorable-contest/adorable-winners-2016/ Contact me for more info and to schedule your child’s session. I had a business portrait head-shot mini session this month, sorry if you missed it as I didn’t blog about it, just sent an email out and posted the special on Facebook. Please let me know if you’d like to be added to my email list, and follow me on Facebook for special updates as well. https://www.facebook.com/lindawilsonphotography to get my specials. The regular price for a business portrait head-shot is $100, which includes a quick custom studio session (anytime by appointment) on a background of your choice, a viewing right after where you choose your favorite photo, and a retouched digital download of that favorite image. Or $150 for 2 different looks (background and/or clothing change) and 2 fully retouched digital photos. However if you missed the head-shot mini session, but would still like to get a nice head shot for the lower mini price than I have come up with a solution for you! Host a Head-Shot Portrait Party! Gather together 4 people (yourself and at least 3 more people) that can schedule all within a 2 hr time frame, and all agree on the same background, and get 4 for the price of 3! Only $75 each for total of $300 rather than $400. Or gather 10 people together within a 3 hr time slot for just $60 each! Each person will have about 15-20 minutes for a quick session, a quick viewing, and a retouched digital photo of their choice sent to them online. 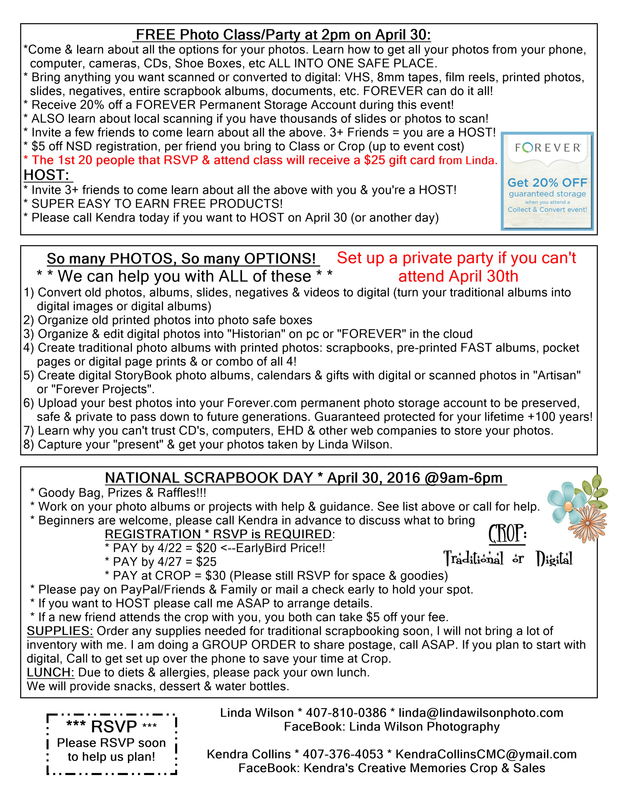 Double Open House and Anniversary Sale! Thank you to everyone who brought in their children to have me enter them in the national adorable contest! I think I had 34 entries in all, and I really believe there will be several winners from my studio! All of your children are adorable!! 🙂 Winners will be announced the end of July. July Special: Monday Digital Only (Artist’s Choice) Sessions! No additional session fees! This Special is only through the month of July, Mondays only, by appointment. Offer does not apply towards a newborn, maternity, or family session, but can be for babies ages 6 months and up, children, teens, personal or business head-shots, couples, or pets. Contact me for more information or to schedule your appointment. Welcome 2015! Looking forward to a fresh start with a new year! It’s an exciting time for us all to see what the new year brings. This year, I want to really strive to provide my clients with full customer service and quality products, so I have a few changes coming. I will continue my model searches, product spotlights, children’s mini sessions, and other specials throughout the year. Follow me here on my blog and on my Facebook page, and let me know if you’d like to be added to my email list. If you had a studio session with me anytime in 2013 or 2014, receive a $15 credit towards your next regular session, by taking my customer survey which will help me provide the best service for everyone. 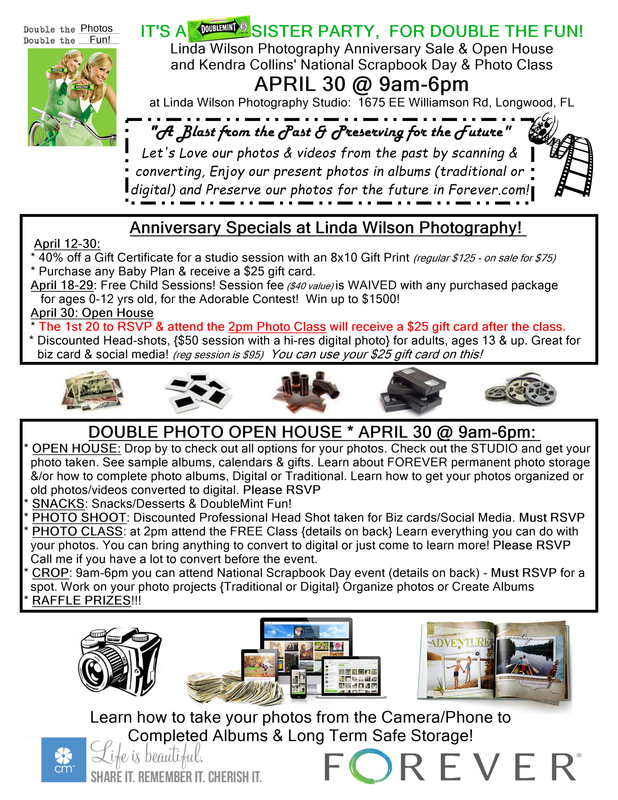 Email me if interested at linda@lindawilsonphoto.com. My first special of the year is the $25 Tuesday! This is a head-shot special for anyone 16 years and older. Come in (by appt.) 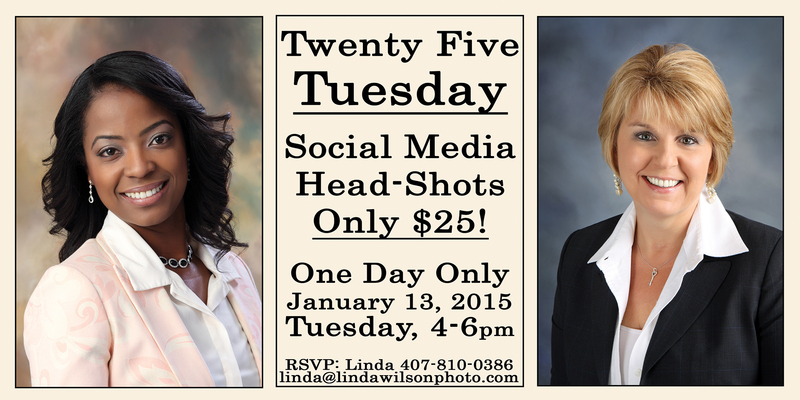 on Tuesday Jan. 13th, between 4-6pm for a new studio portrait head-shot. Update your Facebook or Linked-in profile photo, website, or business card image. Get a fresh look for the new year. Make sure to invite all your friends, and RSVP for an appointment time. Only $25 for a quick studio session with your choice of 2 backdrops and a lightly retouched image emailed directly to you. You may purchase additional images for only $20. Want extra retouching? No problem, just add $10 per image to have your blemishes removed, stray hairs removed, or even look a bit younger. Head-shot special requires minimum of 4 people and hours may be extended depending on amount of interest. The regular price for a business portrait session with image is $75, so contact me soon if you’d like to save money & schedule your $25 headshot appointment for Tues, Jan 13th. Booking sessions every 15 minutes; 2-3 friends may schedule together; choose a background; cash or check only. 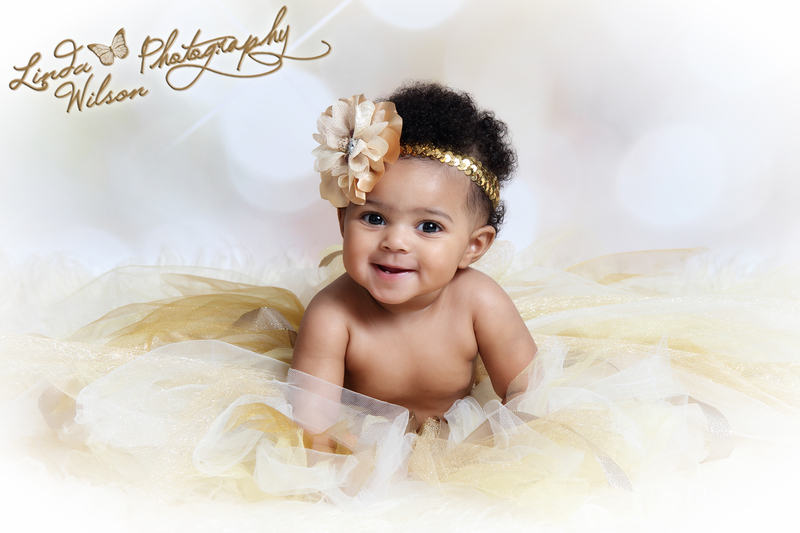 January’s Model Search: Babies between the ages of 3 & 6 months! Bring in your little one for a waived session fee ($50 Value) with a free Facebook photo and 20% off any package, but no purchase is required. The free sessions are by appointment only, weekdays between January 5th and 16th only. It will be a 2 hour time slot; up to a 1 hr studio session, and then about an hour view & order appointment immediately after session. Contact me soon if interested; Limited spots available. Product Spotlight: 11×14 mounted portraits are half price for only $50 this month! Add a custom frame for 25% off the regular prices. Must order by Jan 25th. I’m excited to say that I have officially joined the PPA, the Professional Photographers of America! So I’ll be going to their awesome convention in Nashville, TN at end of the month, taking several photography classes and attending the gigantic trade show. I can’t wait! It’s going to be awesome! As a professional portrait photographer, I’m proud to now be a member of all 3 levels (National, State, and local) of professional photographer’s associations: The PPA (USA), FPP (FL), and the PPSCF (Central FL) and I’m very happy about it! $25 Tuesday! One Day Only! 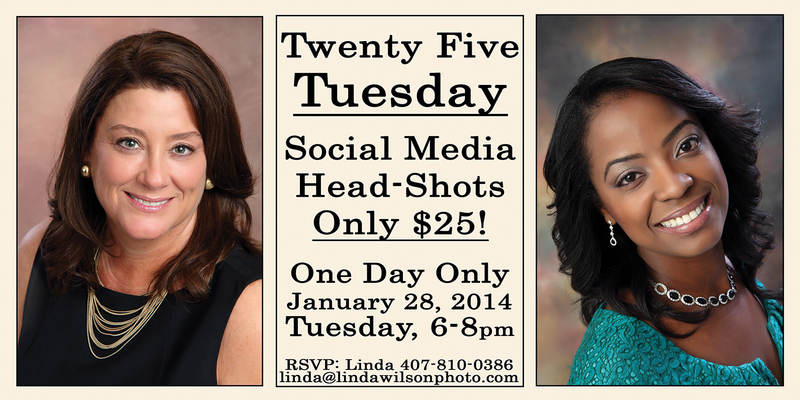 $25 Social Media Head-shots! Please Note: The date has been changed to Tuesday, September 3rd, from 3-7pm. Please contact me soon to reserve a spot. Only $25 for a short mini session and a web-sized enhanced portrait for Facebook, Linked-in, your website, etc. *High resolution upgrades are available for printing purposes. 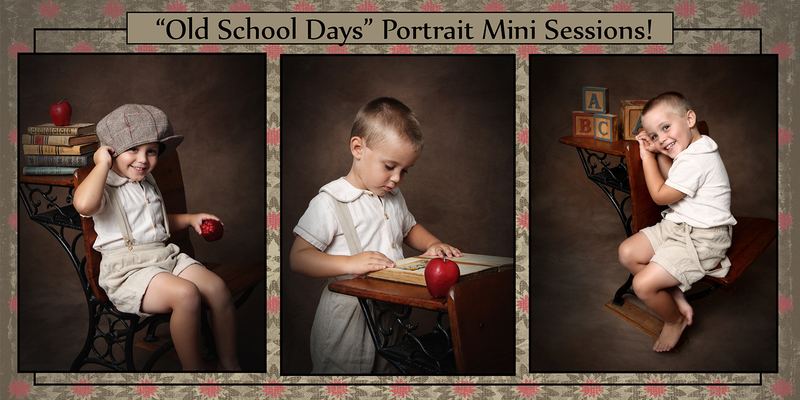 The next mini session themes are “Old School Days” and “Fall Apples.” Session dates are August 30th and September 7th, by appointment only. Contact me by phone or email (info on right) to schedule your child’s appointment. Packages start at only $50! Special Edition Mini Sessions for Easter! I am so excited to offer live bunnies for this year’s Spring Portraits! However I need everyone to sign up ASAP so I know how many days and how many bunnies I need to reserve to rent. As of now, the sessions with live bunnies will be March 15-16, 2013. I will send out more information when all the details are finalized, so visit my blog later for more info. Also make sure to “Like” my Facebook Fan Page to get updates as well. Please contact me soon if interested so I can plan accordingly, thank you! It’s not too late for February’s Specials! Only $50 for the 20 minute session and 3 high res digital photos of your choice! Choice of modern or vintage style session…lots of props to choose from. Throughout the entire month of February, but limited spots available! More information is on my previous blogpost. My New Year’s special for business headshots has been extended throughout the month of February. Only $59 for the studio session, and your favorite image retouched and delivered in 4 versions: In both color & black & white, in high and low resolution. Use your photo for business cards, your website, social media, and more! More information is on a previous blogpost. Contact me soon as my availability is limited! Business Portraits, New Year’s Special! Offer Extended until the end of February 2013!